This beautiful cinnamon color-phase Saskatchewan bear was shot at Marshland Outfitters in the spring of 2013. Until I got into bear hunting, I always thought spring was for fishing. Not anymore. I am totally in love with spring bear hunting, and I can’t imagine a year without it. My first spring bear hunt was a bait hunt in Manitoba, and from there I have done several more bait hunts, plus a spot and stalk hunt in British Columbia and a hound hunt in Idaho. You could say I’m hooked. When speaking of spring bear hunting, the number one thing that comes up seems to be the number of bears seen. While a fall baited bear hunt in Canada may produce sightings of bear every day, spring hunts seems to produce multiple sightings and much more interactions with the bait. That British Columbia hunt I mentioned earlier? I shot the forty-second bear I saw on the six-day hunt. In addition to the sheer number of active bears in the spring, the hunts usually feature pleasant weather and some combination of fishing along with the hunting. Let’s have a brief look at the three options. Most spot and stalk hunts take place in the Western United States and Canada. The open country is conducive to spotting bears from a distance and then putting the sneak on them. I am exclusively a bowhunter, which presents a significant challenge in comparison to a rifle hunter, but that’s a challenge I will gladly accept. Your days will be spent driving and walking logging roads, glassing logging cut blocks and clearings. My BC hunt with Eureka Peak Outfitters was characterized by equal amounts of driving through stunning, beautiful mountain country and hiking deactivated logging roads. It was a nice mix and very productive. When we needed a short break from glassing, my guide stopped off at a mountain stream or beaver pond where we caught rainbow trout on every single cast. I loved this hunt and I would do it again in a heartbeat. 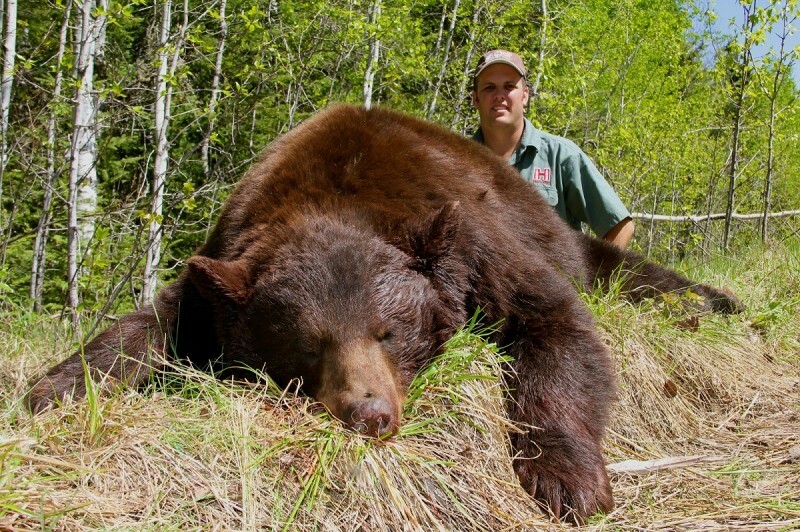 The author took this bear on the sixth day of a British Columbia spot and stalk hunt. He saw a total of 42 bears on the excursion. These spring hunts are available in Alberta, British Columbia and Yukon, and in the following states: Idaho, Arizona, Montana, Washington, Oregon, New Mexico, and Wyoming. If you love dogs and are up to an athletic hunt packed with adrenaline and close encounters with bears, this hunt is one you definitely need to put on your life list. Nearly 20 states offer hound hunting, but, with the exception of Maine, the majority of the spring hound hunts are found in the Western mountain states. My spring hound hunt was with Reggear Outfitting in Idaho and I shot a nice bear in the first hour of the hunt. I could have passed that bear but it was just too perfect. Travis Reggear, like most reputable hound outfitters, runs at a nearly 100 percent success rate. This type of hunt is not for the sedentary, because it often involves climbing steep hills, riding ATVs over rough terrain, and crashing through brush to get to treed bears before they decide to bail out. And that’s all before you shoot it—once the bear hits the ground, you have to get it out, which can be just as tough or tougher depending on where the bear trees. This adrenaline-packed style of hunting is addictive, so be forewarned about that! Hunting bears over bait is often frowned upon by those who have no experience with it. Put out a pile of donuts and get ready to shoot a bear, right? Nothing could be farther from the truth. Hunting bears over bait is a challenge. 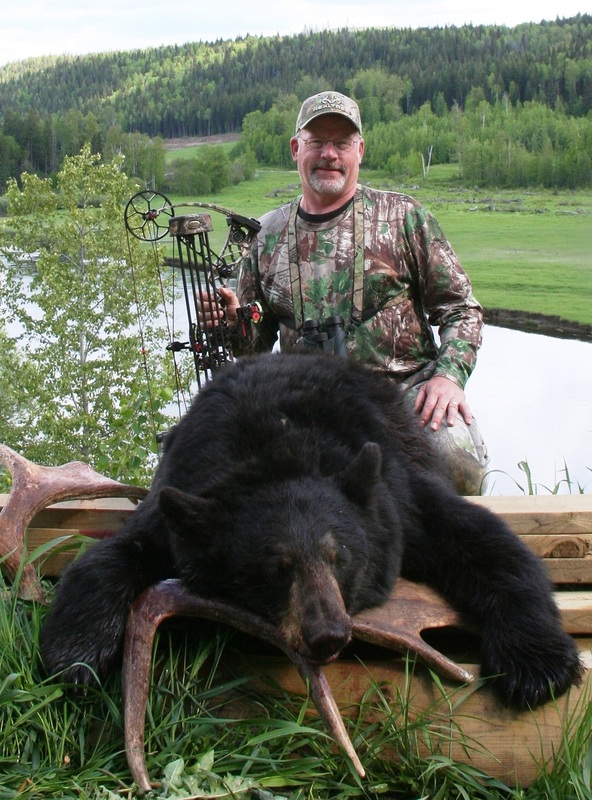 Getting a mature bear to come into a bait site when a hunter is present can be difficult, and having that bear approach during daylight is often a difficult challenge. But if you choose an outfitter with bait sites in remote wilderness areas where the bears have little to no experience with humans, the challenge is not insurmountable. Across Canada, outfitters put out baits before the bears come out of hibernation, so when the bears are ready to eat, the food is waiting for them. These bait sites often become hubs of activity for bears in the area. There is a lot of interaction which increases the chances of bears coming in during daylight. Couple that with the fact that it is daylight until 10:30 p.m. during the spring, and you have a recipe for seeing a lot of bears. In many cases, you will have a choice of which one you want to take. I have hunted spring bears with several outfitters in Manitoba and Saskatchewan and am always amazed at the number of bears I see. The opportunity to witness interactions between bears and their behaviors is not only educational but exhilarating. I enjoy fall bear hunting too, but in the spring, the bait sites aren’t competing with the abundance of natural foods and I regularly see two to three times as many bears on a spring hunt as I do on a fall hunt.